"We loved the Polonia Tour. Loved it! I highly, highly, recommend. Exceeded my high expectations. Just awesome. This tour will never be forgotten as long as I live. It was the first of many to come." From its founding in 1873 to its modern day rebirth, Forgotten Buffalo will introduce you to the historic home of the 2nd largest Polish Colony in America. 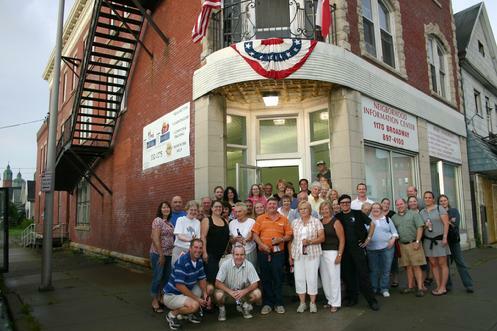 POLONIA PRIDE - Our Flagship Tour featuring Buffalo's Historic Polonia District around the Broadway Market. A POLISH TAVERN CHRISTMAS - Learn about Polish Christmas traditions, sing Polish carols and dance the polka inside family owned Polish taverns. NIAGARA POLONIA - Explore Polish neighborhoods, taverns & sites in Black Rock, North Tonawanda & Niagara Falls. Ted Kania, frequent member of the Forgotten Buffalo Orchestra. All Polonia Pride Tours include music by a LIVE polka band! Ted is always a hit with the ladies. The Eastside of Buffalo is home to some of the region?s most important cultural, ethnic and architectural landmarks. With the founding of St. Stanislaus Parish in 1873, the area became one of the largest Polish-American colonies in the world outside of Poland. Forgotten Buffalo Tours shines the spotlight on century old churches, an old world public market and art-deco masterpieces. Each tour includes a number of stops at friendly neighborhood taverns, a home cooked Polish meal and polka music. Learn about the history of the neighborhood, discover architectural treasures, learn some key Polish phrases and words, dance the polka! We offer TWO Polish theme tours during the year: "Pride of Polonia" & "A Polish Tavern Christmas." Each is unqiue as we explore the rich traditions of Polish culture in Western New York. Many of our Forgotten Buffalo Polish tours include live music by the Forgotten Buffalo ALL-STAR Orchestra. The group is made up of some of the finest and most respected polka musicians in America. Members have included Al Kania, Ted Kania, Tony Krupski, Dave Gawrowski, Whitey Mazurek, Henry Mazurek, Ted Szymanski, Ron Urbanczyk, William "Woddy" Izydorczak and members of the Buffalo Touch. The Forgotten Buffalo ALL-STAR Orchestra make EVERY Forgotten Buffalo stop a one-of-a-kind polka party! Corpus Christi Church & Central Terminal...just two of the Polonia Historic District's landmarks. From the Polonia Historic District to Kaisertown & Black Rock....our Polish Tavern Christmas Tours are an unique way to get into the Christmas spirit. Al Kania and Father Anselm Chalupka, pastor of Corpus Christi Church sing traditional Polish kolendy during our 2009 tour. Forgotten Buffalo Tours recreates the tradition "polka caroling" at taverns in the Historic Polonia District during our famous "Polish Tavern Christmas Tours." The night relives the time when polka musicians would go caroling acoustically from tavern to tavern in exchange for food, drink and donations for charity. Our evening begins with a traditional "Wigilia" style dinner where you'll learn about cherished Polish Christmas holiday customs. Then we hop aboard the Forgotten Buffalo bus and visit some of the BEST family owned Polish taverns in Buffalo. Along the way we will visit extravagantly decorated Polish churches and rekindle family memories. Our live polka band will sing traditional Polish Christmas carols called Kolendy as well as other yuletide favorites. St. Stanislaus Church, the mother church of Buffalo's Polonia, was founded in 1873. Hop off the Forgotten Buffalo bus and discover the Polonia just outside of Buffalo. A few miles down the Niagara River, a vibrant Polish community keeps old world and 20th century Polish-American traditions alive. From Black Rock we follow the historic route of the Erie Canal to North Tonawanda. In the "Lumber City," we explore the 2nd & 3rd Wards along the fabled Oliver Street. Then its up to Niagara Falls where the heavy chemical industry once employed thousands of Poles for generations. Along the way, we will stop at family owned Polish Taverns and Polish private clubs. As with all our Polish tours, you'll find yourself dancing the polka to live music with the Forgotten Buffalo Orchestra! See our schedule for future dates. Family owned Polish taverns like Arty's Grill are always part of a Forgotten Buffalo Tour. Live music, historic gin mills, great friends..... its Forgotten Buffalo! E-mail ForgottenBuffalo@aol.com or call 716-833-5211 for details and availability. Current tours cost $50 - $55 per person. Price includes meal, bus transportation, docent led guided tour, prizes and giveaways. Must be 21 years of age to participate. E-mail or phone reservations will be held for 48 hours only. Cancellations or changes less than 3 business days prior to tour will be subject to a non refundable deposit of $30. No shows or cancellations less than 24 hours prior to tour will forfeit any refund or credit. Payment in full must be received no later than 4 business days prior to the requested tour date and can be made with check or money order.